With increased consumption of sweets, cocktails and other high caloric foods paired with less time to exercise and more stress, it is not surprising that studies show adults gain an average 1-5 pounds throughout the holiday season (Halloween to New Years’ Day). Fear not…it is possible to prevent holiday weight gain while still enjoying your favorite holiday traditions with family and friends. Follow the easy tips below to maintain your weight and health during the most wonderful time of year! Focus on weight management rather than weight loss. Set obtainable goals throughout the holidays to prevent frustration and disappointment. Portion control! 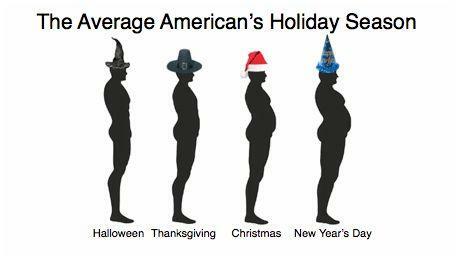 Enjoy your favorite holiday treats, but do not overindulge! Take a small portion, eat slowly, and savor the taste and texture of the wonderful foods of the season. Make exercise a priority as it helps to relieve stress and prevent weight gain. Don’t let exercise take the back seat during this time of year. If time and location prevents you from completing your normal exercise routine, try sneaking in exercise whenever and wherever you can by taking a walk after a large meal, taking the stairs instead of the elevator, and parking farther away from buildings. Do not skip meals in hopes of saving calories for parties and holiday meals. Skipping breakfast or lunch before a big holiday dinner actually may cause you to overeat and consume more calories. Eat a snack before you leave home. If you arrive at a party starving, you are more likely to eat too much. Make healthy dishes! When you are hosting, make sure the menu includes lower-calorie foods, such as fruits, vegetables, and lean meats. When you are a guest, bring along a lower-calorie dish to share. Fill your plate with a rainbow of colors. Make half of your plate fruits and vegetables to keep calories low. Listen to your appetite. Pace yourself and become more aware of what you are eating and drinking. Eat until you are satisfied, not stuffed. Drink alcohol in moderation and choose lower calorie options. Try to limit alcohol to 1-2 glasses a day. Drink a glass of water between each alcoholic beverage and choose lite beer, wine or wine spritzers, and liquor mixed with soda water for lower calorie options. Do not drink your calories! Consume calorie-free beverages more often such as diet sodas, flavored water, and water instead of punches, eggnog, and mixed drinks that can have up to 500 calories per cup. Stand away from buffet tables and food trays to avoid mindless eating. Make the holiday season about enjoying your family and friends, rather than all about the food. Talk more, play games, and eat less! Learn to say “no” politely when pressured into eating higher calorie foods or second helpings. You can say: “no thank you, I have had enough, and everything was delicious” to avoid hurting loved ones’ feelings. Social events do not mean that you have to totally abandon proper eating habits. Remember little changes add up to big successes! Even if you are not completely successful at eating right, compliment yourself for trying and then try harder the next time!